Less than 3 weeks to CSA pickups! Posted 5/18/2018 2:32pm by John and Aimee Good. CSA Pickups set to begin the first full week of June! Less than 3 weeks away. We hope you are getting excited! We are excited to see a big jump in the growth of all the spring crops we planted last month. April was so windy and dry, that although this is a lot of rain, it is quite a benefit to the crops. I swear the snap peas seemed to grow about 3 inches overnight! 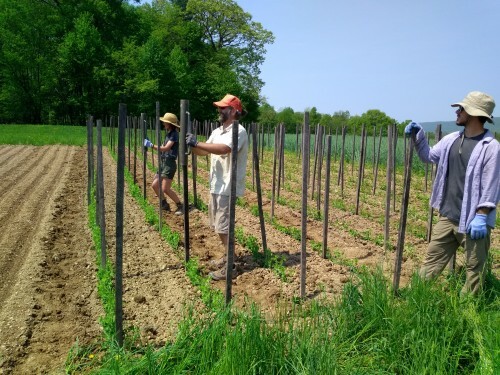 Here we are pounding stakes to trellis the peas, which can grow up to 4-5' tall. From right to left, farm apprentice David Darling, farmer John, and farm apprentice Megan Sonier. We were all building muscles that day! 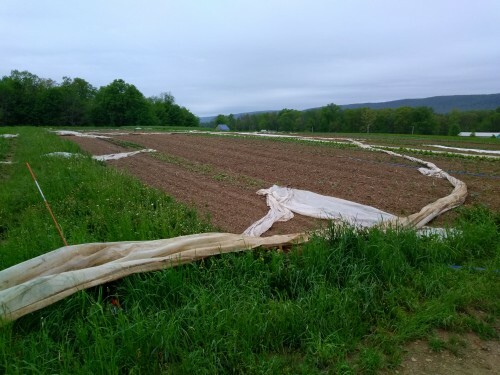 We were not excited however, to see every single row cover on the farm, which had been covering all the tender young crops, get twisted and blown away in the crazy windstorm on Tuesday night. It took 5 of us all morning long, in the pouring rain of course, to drag them back, untwist them, and re-pin them in the fields Wednesday morning. Never before have we seen every single one get blown away in a single storm. Ahh, farming. Always full of joys and heartaches, or muscle aches, as the case may be. Planting, planting, planting! This wet cool weather has been great for planting. No stress at all for the plants. This week we put out a half acre of winter squash, as well as watermelons and muskmelons, field tomatoes, head lettuce, flowers, herbs, and more. We had to lose our boots and just go barefoot at times, as the mud was clinging to our boots, making them so heavy! Luckily the shale in our soils is mostly small pieces. Next week we will put out all the peppers and eggplant, as well as the first planting of sweet corn! 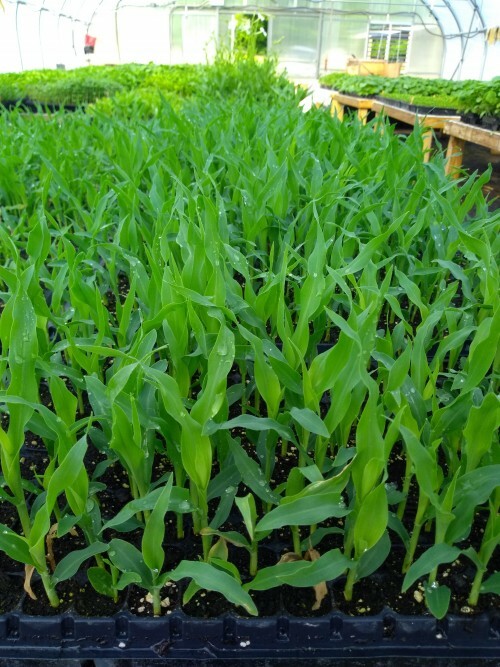 The corn plants (pictured here) look beautiful and are ready to move on from the greenhouse to the field. This is such an exciting time of year, as we plant out most of the entire farm, full of promise and expectation of the coming harvest. We look forward to beginning the journey of this harvest season with you in just a few short weeks!